I've never been one for enjoying yard work. It is a necessary evil to owning a house in both my and my wife's perspective. I know some people love it and they have beautiful yards to show for it. But it isn't me. There was a day or two when I actually liked raising tomato plants. We bought our plants at the farmers market in Madison one year and had a great crop. We were successful urban farmers. So, the next year we bought a few more tomato plants and what happened? They contracted some sort of mold wilt disease. So we stopped that nonsense. I realize there's some people out there who would call us lazy, but I don't think that's fair. It's just that we loathe gardening and yard work. It doesn't trip our trigger. If I we had our way, we'd pave the entire back yard - maybe make it a skateboard park. Better check my insurance policy on that first. I'll get back to ya. We've recently added some artwork to our garage in our attempts to make it more visually appealing. 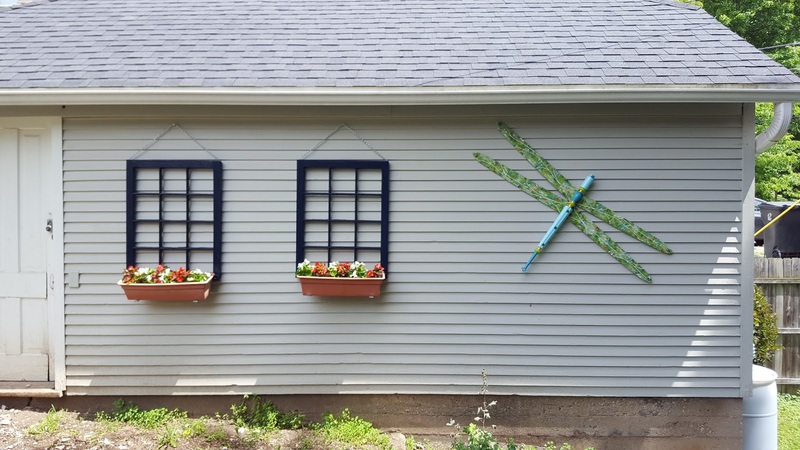 The dragonfly above was made by a friend and the two planters were creations my wife designed and I assembled. The next project is to build a patio out of what was once covered by a building attached to our garage. It has been 10 years in the "design formulation stage," but may not make it until 2017. So, despite all appearances, we're trying. Baby steps, people. Having said that, my latest thing is sitting in my back yard with my dog for an hour near dusk, writing, checking email and the like. It's been a good summer weather wise for this new habit. It's been too hot to stay inside and with daylight lingering as long as it does, it seems sad to waste it sitting inside. I've also discovered that my back yard is a decent haven for me and a sort of animal refuge for lots of different critters. In a single evening I spotted cardinals, swallows, squirrels, chipmunks, rabbits and countless sparrows and finches. Of course I have to overlook the fact that the invasive creeping charlie has overtaken my grass, but I've gotten used to it and am okay with letting nature run it's course. I am one of those green freaks who cannot see using all kinds of poison and fertilizers that will end up in the bloodstream of the very critters just mentioned or the watershed of tomorrow's ice tea. The other night I sat in my Adirondack chair with a pen and paper and wrote two pages for my book with my dog at my side. It was freeing to be away from my computer, phone, tablet and iPod. I know I wouldn't typically get two pages written if I was on my laptop. There is still something therapeutic about writing in longhand - a dying art, to be sure. As I sat there channeling my thoughts I watched my dog snap at bugs. When it approached dusk, I watched the fireflies rise out of the grass. I know my time in the back yard is limited. Fall looms and the days are getting shorter, so my urgency is ramped up more these late days in July. Also, my dog has become used to the routine to the point of lingering at the back door after dinner in hopes that I might invite him out with me. If I don't he whines until I do. He's become a creature of our habit. We're buds, hanging out in my beautiful, tragically neglected back yard together. First, compliments on the garage--love, love, love the dragonfly. And the flower.box design is terrific too. A patio sounds just right. 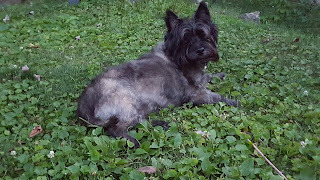 And then a comment on your Adirondack chair,the backyard, your dog, listening to nature, being part of it, and enjoying all that green--writing a couple of pages. I don't go anywhere without my notebook--write out everything long hand before I ever touch a computer. It doesn't tire your eyes as much either. enjoyed the fireflies, the birds, enjoyed spending a few minutes here pondering your experience.